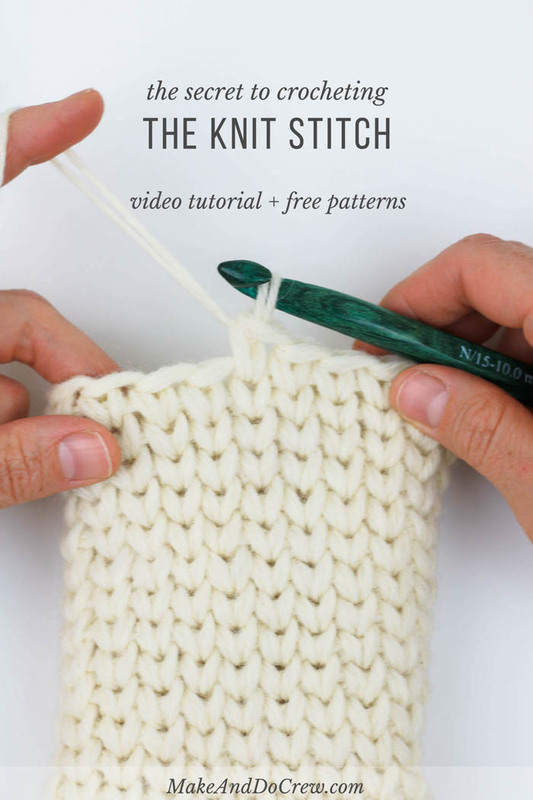 Learn how to crochet the knit stitch successfully in this step-by-step video tutorial. 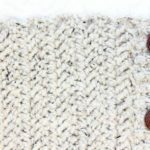 The knit stitch (AKA the waistcoat or center single crochet stitch) can be tricky at first, but trying the few specific tips mentioned in this video, you’ll know how to make crochet look like knitting in no time! 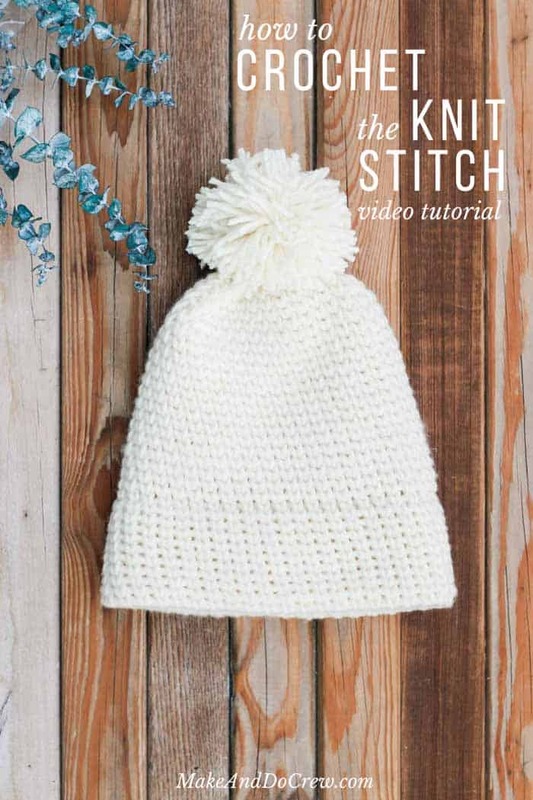 This free knit-stitch video tutorial is part of a collaboration with my friends at Lion Brand Yarn. This post contains affiliate links. UPDATE: I’ve put together a collection of 15+ of my favorite modern FREE crochet patterns that look knit here! Can I make a crochet confession? While I love the freeform nature of crochet, I often prefer the look of knitting. 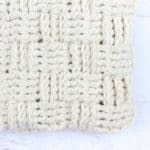 Is that a sin to admit on a crochet blog? I don’t think so, right? All yarn lovers can be friends, whether we’re knitting, crocheting or–like my kids–just cutting up old skeins. P.S. You can always find all my stitch tutorials and round ups here. Find all my crochet video tutorials here. The thing I love about the knit stitch/waistcoat stitch/center single crochet stitch is that is worked using ONLY single crochet. Seriously! Once you get your tension working and master the few tips I share here, this stitch is e-a-s-y. Personally, I find that the knit stitch looks a lot more like legit stockinette when worked in the round versus in rows. It can be crocheted either way though, so find what works the best for you and what serves the purpose of your project. 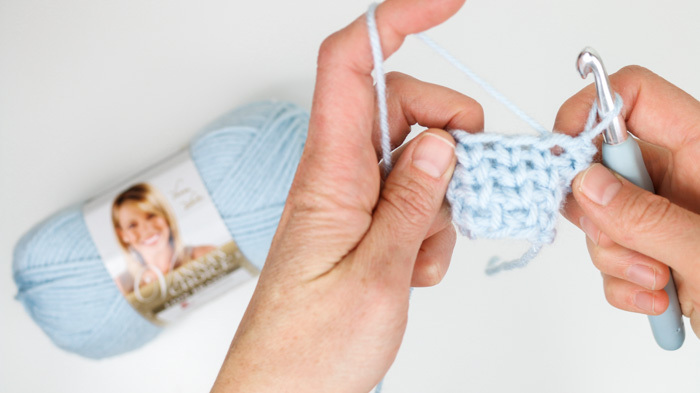 In the video tutorial below, I cover how to crochet the knit stitch in the round as well as how to make the join as invisible as possible while you work. Scroll down a bit further for the written instructions. 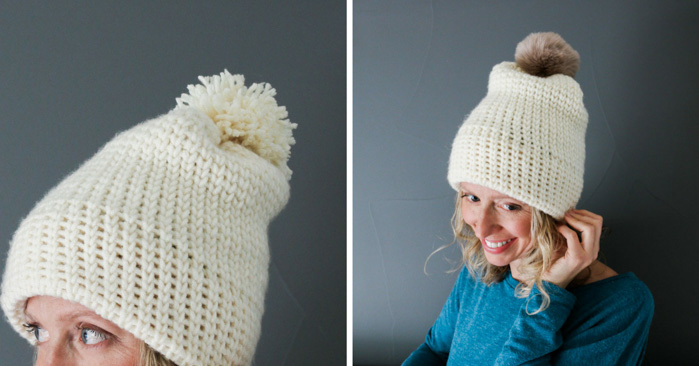 And if you’re interested in trying out the knit stitch on a project, you can find the free Everyday Crochet Beanie here and the free Morning Mittens pattern here. Then learn how to dye your mittens with food coloring here! This “How to Crochet the Knit Stitch” video tutorial is part of a collaboration with Lion Brand Yarn. You can find the Vanna’s Choice yarn used in this tutorial here. 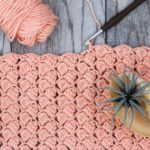 – Work in rounds by chaining one at the beginning of the round and slip stitching to the first single crochet at the end of the round. – Work in a spiral in an amigurumi-type method. For this tutorial, I’m describing the first option, but just know that both are possible. Foundation Round: Ch any multiple of chains, sl st to first ch of round to form a circle. Round 1: Ch 1, sc in each ch, sl st to first sc to join. Round 2: Ch 1, sc in between the posts of each sc (see photo below), sl st to first sc to join. Repeat Round 2 for remainder of project. 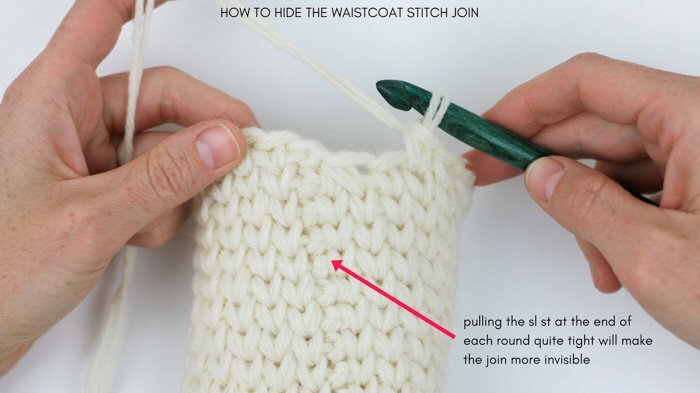 • Use a larger hook than you usually would for the yarn. I can’t stress this enough. You need a significantly bigger hook to make the spaces between the single crochet posts wide enough to insert your hook through. 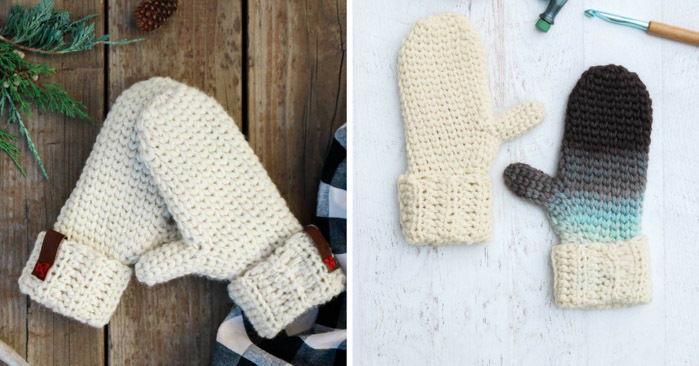 You can shape items crocheted with the knit stitch just as you would any other crochet project. Increasing is as simple as working two single crochets into the same space between the single crochet posts. If you’re wondering how to decrease using the knit stitch though, it’s also very similar to a typical sc2tog. In the photo on the right below, you can see how the sc2tog is simply worked between the posts of two sc stitches. When you have three loops on your hook as pictured on the right, you’ll yarn over and pull through all three loops. This will decrease your round by one stitch. 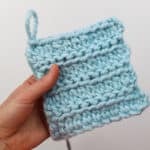 I hope this tutorial helps you know how to crochet the knit stitch with confidence! If you have any pattern ideas you’d like to see created with this stitch, please let me know in the comments below. 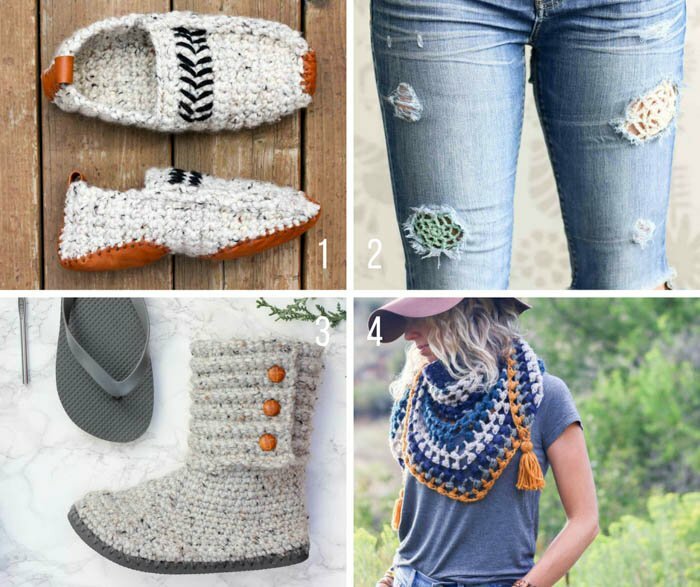 Here are some other free crochet patterns and tutorials you might enjoy. You can find all my crochet video tutorials here. Thank you so very much for showing me how to crochet like that. I enjoy watching your tutorial videos. I would like to make a suggestion though. As a beginner, I need to have your camera closer to your work so I can see exactly what you are doing. Experienced cricketers and knitters probably can figure out what you are doing. I like to watch your video and then pause it and then crochet what you are doing. WOW, need to find this site on my desktop computer. Thank you for sharing!!!!!! When I learned tbis stitch a couple of years ago it was called a split stitch. Thank you! Love this stitch. The video was a little difficult to hear your explanation as music was playing loudly. I have used many of your patterns and love them all. Great tutorial except for the unnecessary music which made it hard to hear you. I’ve made several of your crochet items and you do a fantastic job. Than you. Thanks for the feedback. Are you talking about the music at the very beginning and very end of the tutorial? I’m guessing so as that is the only music involved. Thanks for letting me know it didn’t work well for you. The music starts at about 2:52 and it’s loud! It really does make it difficult to hear what you’re saying. Thanks for sharing this stitch! It just started right in the middle somewhere LOLOL, I didn’t notice where because I stopped watching the video because I started looking for the ad so I could stop it. 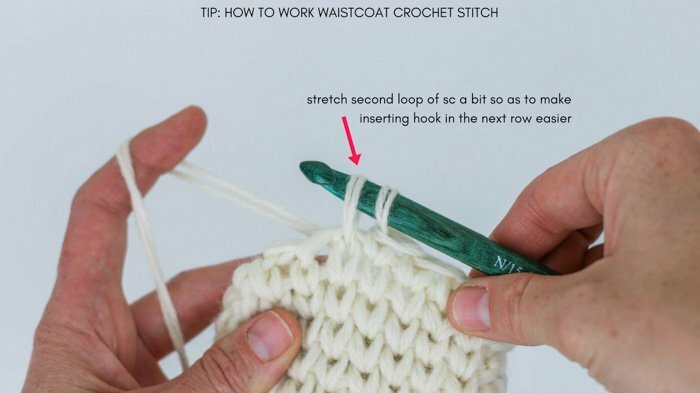 Thanks and I love this stitch tutorial….and you are a really good instructor. Oh man. That is totally my mistake. The was a extra audio clip included in my edited video at the last second. I am so sorry! I’m fixing it now, lol. Thanks for the kind words about my teaching. Apparently I’m a better teacher than video editor! The music starts at 2:50 and is super loud, we can’t hear what you’re saying. Oh my gosh. What a goof up! That shouldn’t be there, lol. I can see how you wouldn’t be able to hear me! I’ll get a different version uploaded asap. I would have enjoyed watching this video if the annoying music would have let me hear what you were saying. I’ll fine another video to learn this stitch. I’m sorry, Jackie. I made a mistake and have corrected it. Thanks for your patience. I’m so excited to try this stitch out. Fantastic tutorial, but I do have to agree with the comments above, the music over your speaking from 2:52 onwards makes it almost impossible to follow. It really is an amazing and beautiful tutorial though, thank you for taking the time to film and share! Thanks Sarah! The music was a total accident and shouldn’t be there! Oops! Removing it now! I liked your simple explanation, I can’t wait to try this stitch. I cannot wait to try this! My dad always complains about how many holes there are in my crochet projects. He simply does not understand that certain patterns are supposed to have holes. I cannot wait to show him! Haha! That sounds like a dad thing to complain about! 😉 I can imagine my dad saying the same thing. This will be perfect for him. One of the best criochet tutorials I’ve seen! Well done! Can’t wait to try this! Thanks so much, Majesty! I hope you enjoy it! I really like using this stitch. I know God will Bless you in some way for sharing and giving your knowledge to others. I’ve have always wanted to do this. Thank you so very much. 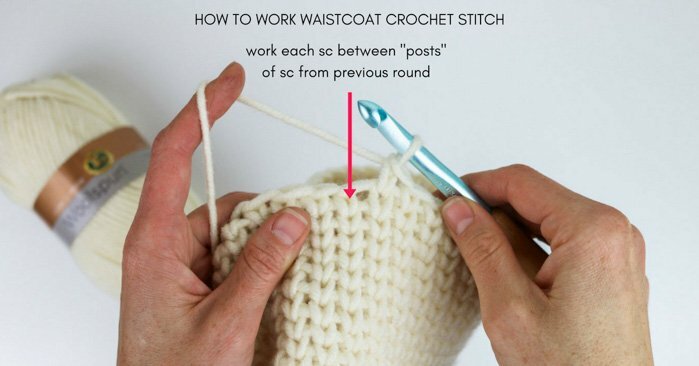 To crochet the knit stitch – does it have to be in “THE ROUND ” ? Hi, for some reason I cannot find or access your video tutorials, I haven’t crocheted for a number of years, your blogs piqued my interest again but each link is taking me back and forth, been trying for 20 minutes. Was interested in the knit stitch. I’m sorry for your trouble. The video tutorial is within the blog post, above this comment area. It’s below the introduction, but above the written instructions. Are you not able to see it? What type of device and internet browser are you using? Absolutly love the video!! I’ve wanted to know how this was done, and listening to the explanation was so helpful! Thank you!! I’m so happy to hear that Kayla! I’ve wanted to master this one for a long time too. 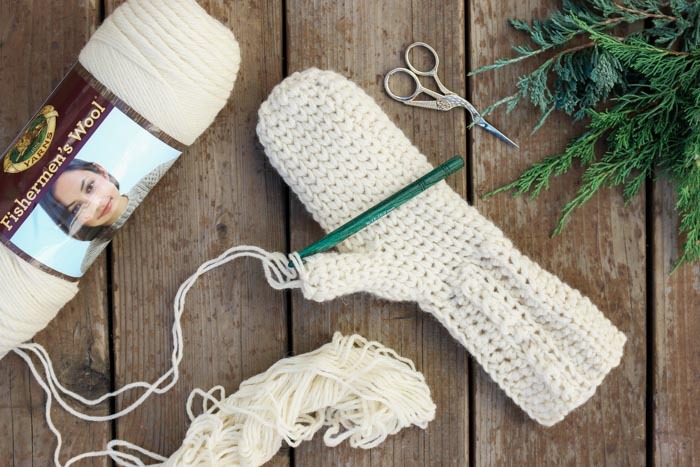 Is the knit stitch as stretchy as a regular knit made with knitting needles? I prefer crocheting–have not knitted in a very long time, but sometimes I think a knitted project works better than a crocheted one. Thank you for the video tutorial and written instructions. I’d say it’s a bit stiffer (and less stretchy overall) than a knit stitch. There’s more yarn involved in the crochet version, so I think that is what contributes to the overall sturdier feeling. Hope that helps! 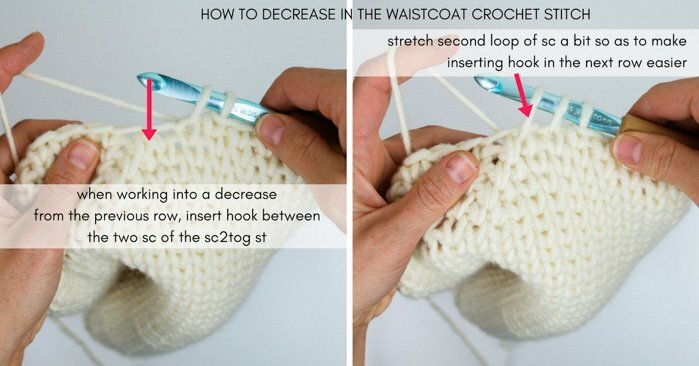 Where do you find crochet hooks like you used on the video tutorial of how to do the knit stitch with a crochet hoook?